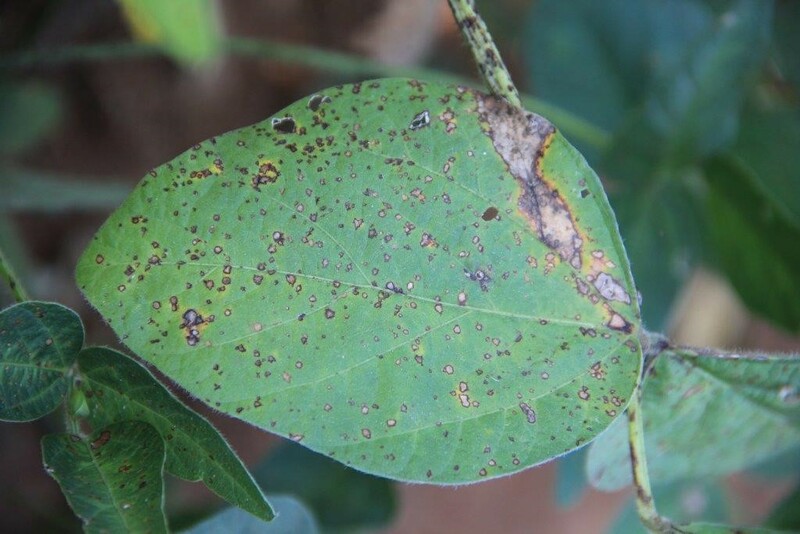 Frogeye leaf spot (FLS), caused by the fungus Cercospora sojina, is a major disease of soybeans in the southern United States. Estimates of yield loss due to FLS have been reported to be as high as 30 percent on susceptible varieties when extensive leaf blighting occurs. Excessive defoliation often causes infested fields to mature prematurely in years when FLS is severe. 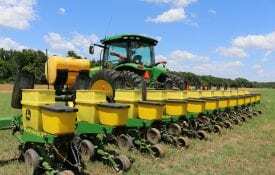 The disease is most common when soybeans are grown continuously in the same field, particularly in reduced tillage systems, since the pathogen is residue-borne. Populations of FLS resistant to strobilurin-type fungicides were first reported in the United States in 2010. FLS populations resistant to that fungicide class were detected in multiple counties in Alabama in 2012. 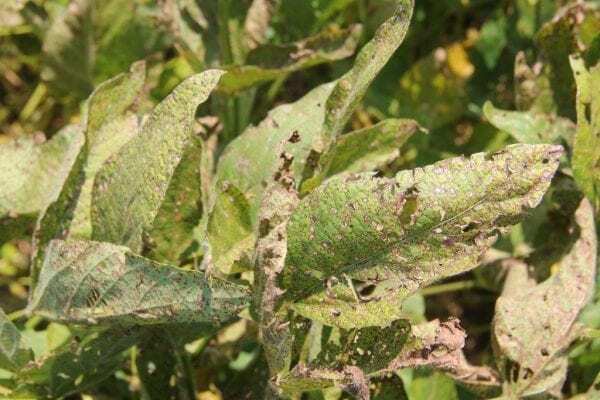 The presence of resistant strains of FLS in Alabama makes following disease-resistance management guidelines a necessity for soybean farmers in the state. Figure 1. Symptoms of frogeye leaf spot on soybeans first appear as small, dark spots on the leaves. Spots then enlarge and become angular. larger lesions creating irregular patterns of blighting on the leaf (figure 2). FLS lesions on stems and pods can occur later in the season, but they are less common and not as distinctive as lesions on the leaf. Stem infections appear as long, narrow, dark lesions with flattened centers. Pod lesions are circular to elongated, slightly sunken, and reddish-brown in color. As with foliar lesions, the centers of stem and pod lesions become gray to brown as they mature. Severe pod infections can result in infected and discolored seed. Seeds near pod lesions can be infected and develop conspicuous light to dark gray or brown blotches or specks on the seed coat. The coats of infected seed may also crack and flake away. The primary sources of FLS inoculum are infested plant residue, infected seed, and airborne spores. Seed infection is common and contributes to long distance spread of the pathogen. Infected seed germinates poorly and the resulting seedlings are often weak. Spores produced on the cotyledons of infected seedlings are the main source of inoculum for the leaf phase of the disease. Leaf infection can occur at any stage of soybean development but most often occurs after flowering, typically in the upper canopy. Infection occurs more readily in young leaves than in older, mature leaves. This is why symptoms of FLS are mostly observed in the upper canopy when it occurs late in the season. FLS development is favored by warm, humid conditions coupled with cloudy days and extended periods of wet weather. These conditions promote sporulation of the pathogen that can create cycles of leaf infection throughout the season. Spores of the fungus are dispersed by wind or splashing rain from plant to plant and from field to field. Tillage Practices. FLS survives in infested soybean residue. Therefore, tillage and crop rotation are an effective means of reducing the pathogen population from season to season. The earlier a tillage operation is made, the more effective it is in reducing the population. It is best to till under infested residues directly after soybean harvest rather than after a subsequent crop. Figure 2. Leaf spots can merge forming larger spots on the leaves. Resistant Varieties: Some soybean varieties are less susceptible than others to FLS. An FLS-resistant variety should be used if a field has a history of the disease or if FLS was a problem in a particular field the previous year. Farmers need to be aware of a variety’s resistant package in order to properly select an effective fungicide management program later in the season. Fungicide Resistance Management. Growers should not rely on only one class of fungicide to manage FLS. Fungicides from different chemistry classes can be applied together to reduce selection pressure on the fungal population. Apply foliar fungicides only to control plant diseases; do not apply them for other reasons such as growth promotion or plant health. 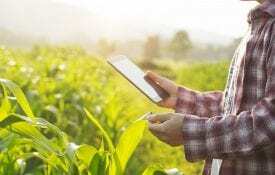 Every time a fungicide is applied, the active ingredient exerts a selection pressure on the fungal population, and individual fungal isolates may be selected that are not as sensitive to that class of fungicide. Keeping this selection pressure to a minimum is important in prolonging the effectiveness and lifespan of a fungicide class. To learn more about fungicide resistance, visit Plant Management Network’s Soybean Resistance Hub at www.plantmanagementnetwork.org. 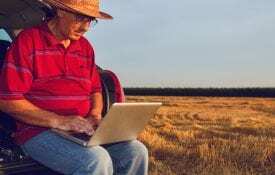 When Should a Fungicide Be Used? If weather conditions favor disease development, use a pre-mix or tank-mix such as strobilurin plus a triazole fungicide at the R3/R4 growth stage if you planted an FLS resistant/ tolerant variety. Consider using a pre-mix or tank-mix option such as a strobilurin plus a triazole fungicide if an FLS-susceptible variety was planted. Do not use reduced fungicide rates as this practice will increase the potential for development of fungicide-resistant strains of FLS. If you applied a strobilurin fungicide at the R3/ R4 growth stage but observe symptoms of FLS increasing in a treated field, consider applying a triazole fungicide if soybeans have not yet reached the full pod (R6) growth stage.